Easily laundered, new Petra makes light work of so many tasks. 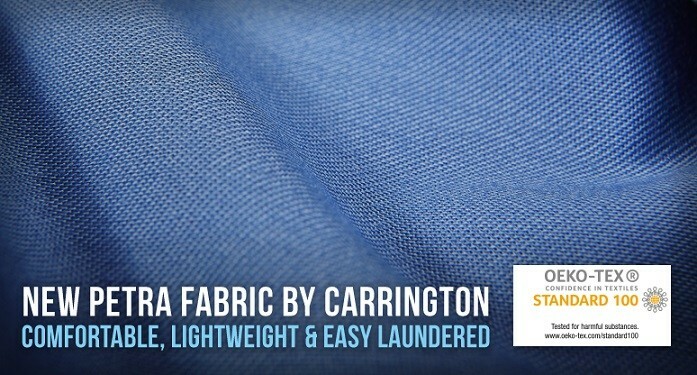 New Petra fabric by Carrington. Apparel worn in sectors such as food, beauty or healthcare has to be kept absolutely clean and spotless – but as it’s often worn in warm working environments, it also has to be light in weight and easy to wear. Yet not every lightweight fabric can withstand the industrial laundering required to ensure the garments are always hygienically immaculate. That’s why we’ve developed new Petra, a lighter weight version of our popular and versatile Kimi fabric that solves the problem. Oeko-Tex certified, new Petra is a lightweight 4/1 satin offering a combination of benefits. It has a superior handle and drape, which means it gives a stylish look to garments. Yet although it’s a lightweight fabric, it has a dense construction which reduces transparency, thus avoiding a common drawback with fabrics in this category. And, thanks to the fact that it’s cotton-rich, it’s comfortable to wear in all types of situations where high temperatures are encountered. New Petra delivers all of this – yet it can be industrially laundered, even at its lighter weight of just 185gsm. So apparel can be kept scrupulously clean without losing their smart appearance.